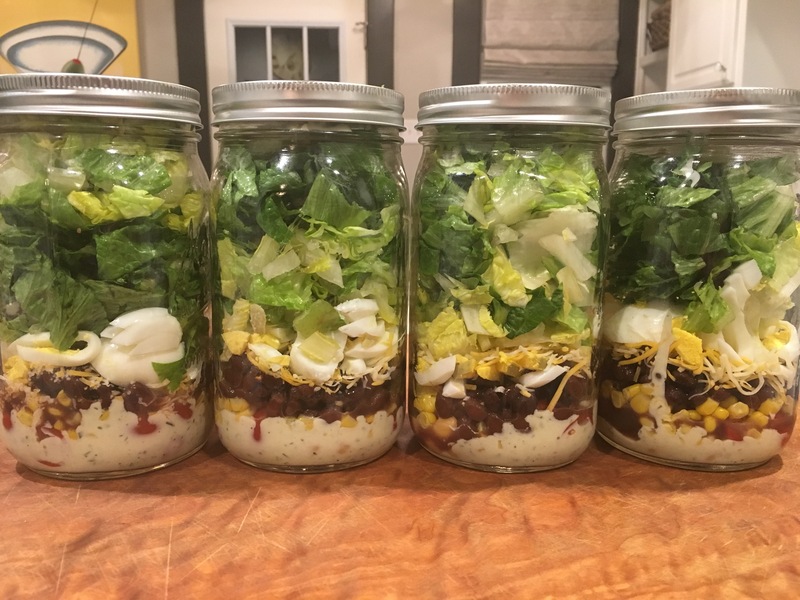 One day in a Weight Watchers meeting, a member mentioned Mason jar salads. She said it was the easiest way to prepare salads ahead of time and prevent the salad from getting soggy from the dressing. This was genius to me. Did I try it right away? No. I don’t do anything right away. I had to do some research on the subject, review the research and then review again. I had to make sure this was going to work (I have since learned just to trust what my WW members and friends tell me). Once I was convinced this was a good experiment, I had to buy Mason jars. The problem was the sheer number of jars – I discovered they’re not sold individually but in packs of twelve. Now, I am very cost-conscious as I am the CFO for our household and I will mull things over where expenditures are concerned. But where food is concerned, I also need instant gratification. Every so often this dichotomy presents a problem. It did the day I decided to buy Mason jars and I found myself in Walmart. Why? Because Walmart did not have individual Mason jars. They were sold in packs of a dozen. Did I need 12 Mason jars? No, probably not. It is just Steve and me at home, for the most part. But did I want 12 Mason jars? Well, I wanted to try this experiment at that very moment. So yes, I bought the Mason jars, the economics bowing in subjugation to the culinary. And it was the best decision ever!! 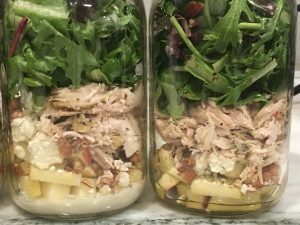 Mason jar salads are now a staple at our home. 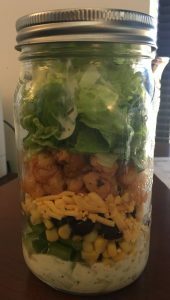 I’d say most weeks we have Mason jar salads of some sort. Some of the varieties have been Mexican salad, Greek salad, Cobb salad and chicken apple salad. The key is the order in which you add the ingredients to the jar. Starting at the bottom, you add the dressing then you add the next hardest ingredients so that they do not absorb the dressing but instead just sit or marinade in the dressing, then build up from there, ending with the greens – lettuce, spinach, kale, etc. Note 1: You can add as much or as little of each ingredient. I say two tablespoons of corn and black beans but it may have been more depending on whether it looked like a sufficient amount. Note 1: We will buy marinated chicken, usually two chicken breasts and then divide between four Mason jars. We bake the chicken in the oven at 425 for 20 or 25 minutes (until done to our likeness) and then remove and shred the chicken. Divide the whole equally between the jars. One important item of note on the greens (lettuce, arugula, kale, spinach, etc): The amount of greens depends on whether you want to eat right out of the jar. I usually jam in as much lettuce as I can because I take them to work and shake out the salad into a bowl. But the other alternative is to leave room in the jar, shake the jar and then eat out of the jar. Completely up to you. If you want to simply shake the jar and use it as the container, put in less of the green stuff. 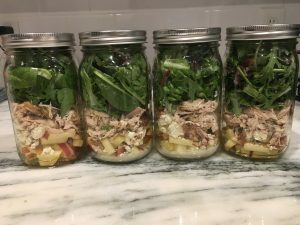 We usually make four Mason jars salads each week and, between us, we just see who wants what when (though admittedly we usually each have two over the course of a week). We have weeks where Steve decides no more greens for him which means simply more Mason jar salads for me! Either way, the salads stay fresh and taste just as good on Friday as they did on Monday! It really works. One final note on Mason Jars. We use them for food storage now. I thought to myself if they worked for salad for preserving the salads, it should work for any food. It does. Anything. 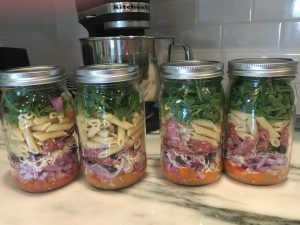 We have homemade vegetable broth, minced garlic, cooked pasta, chopped vegetables – all in Mason jars. Reusable. Washable. Lasts longer. What’s not to love? !